Haleem is basically spicy lentil soup. I found that soup mix is a handy thing to make it. Though I mix moog dal with soup mix in this recipe. Soup mix actually mix of wheat, red lentil, split peas mixture . If you want to make by yourself , just use equal amount of wheat red lentil, split peas, moong dal and green moong(mashkolai / urad dal). I skipped green moong (mashkolai dal in this recipe) and added moong dal with soup mix here . 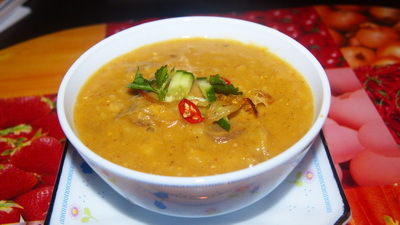 Hope you will like home made the flavour of haleem. 1. Soak the soup mix, kali jeera rice and moong dal together at least 1 hour. 2. Boil it till it becomes tender. Let it cool down and blend it. 3. Fry the onion till it becomes golden brown. Take out ½ amount of fried onion from oil and keep aside. 4. In oil add all powder and paste spices except cumin. 5. When oil comes out add meat and cook till it becomes tender. 6. Add soup mix puree, salt and water. Bring it to boil and add cumin. Take off from stove. 7. 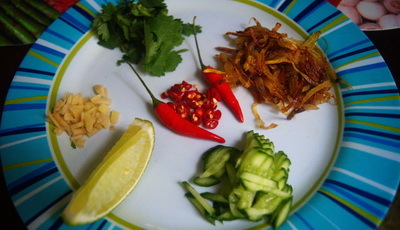 Serve haleem hot with cucumber, fried onion, lemon, ginger and black salt. Thanks for the Haleem recipe. I’m looking forward to making it! Could you please confirm by return email the actual quantity of Soup Mix and Moong dal? Thanks for that. I fixed the amount. hi,I’m looking for a recipe of golap jam sweet.can you post a recipe please. What soup mix is this? Can i omit this step and use plain water? 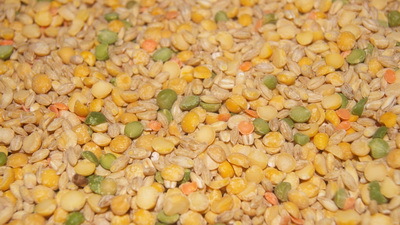 Soup mix is the mixture of several kinds of lentils. lentils are man ingredients of Haleem. Thanks. What exactly is soup mix? What lentils are in soup mix exactly and how much of each lentil do I need to use for the haleem. Please specify. I’m a new cook. Need more exact directions. Thanks. soup mix actually mix of wheat, red lentil, split peas mixture . If you want to make by yourself , just use equal amount of wheat red lentil, split peas, moong dal and green moong(mashkolai / urad dal). I skip green moong (mashkolai dal in this recipe).Thanks and Eid Mubarrak . Your Haleem recipe is very simple in cooking process . can different types of cereal be used in making haleem ? You can use different types of cereal , even oats. Thanks. Haleem is fine with Diabetic people, just need to consume small portion. I will try to post for diabetic food.